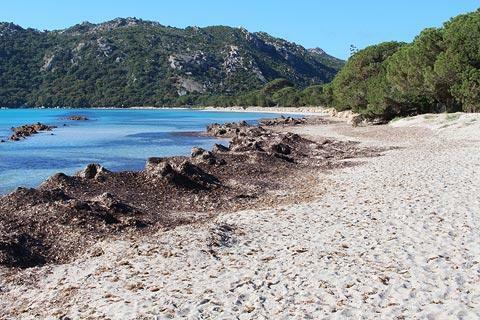 There are lots of exceptional beaches along the coast both north and south of Porto-Vecchio in south-east Corsica. 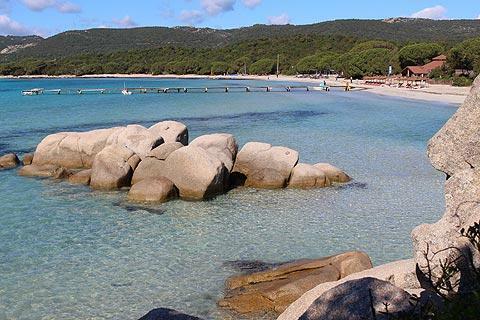 Among these, our favourites are the cluster of beaches to the south-east of the town and including Palombaggia beach, Tamaricciu beach (also known as Falacca beach) and Santa-Giulia beach. 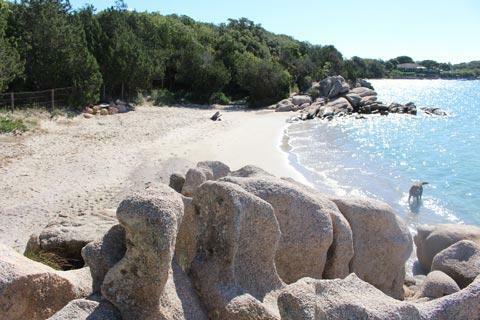 These three beaches have a lot in common with each other: they are all long sandy beaches around curved bays all have various trees and sand dunes behind them and rocky promontories to the side. They are all very lovely and, in short, whichever you choose you won't be disappointed! 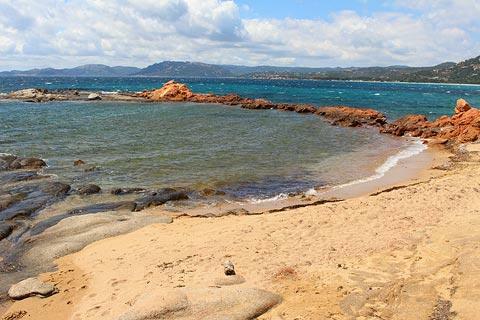 The most northerly of these three beaches is Palombaggia beach. This is also the only one of the three beaches to have a large car park and is the most accessible of the three: as a consequence it also becomes very crowded in summer. There are several bars and restaurants along the beach. 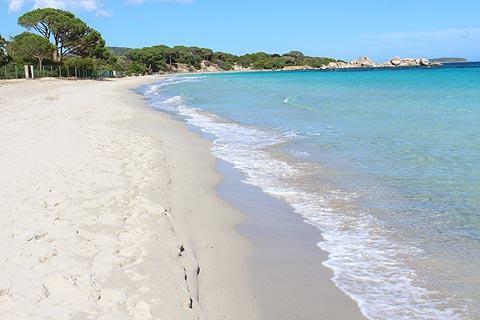 Palombaggia is one of the most famous beaches in the world, and often voted on '10 top beaches' lists. 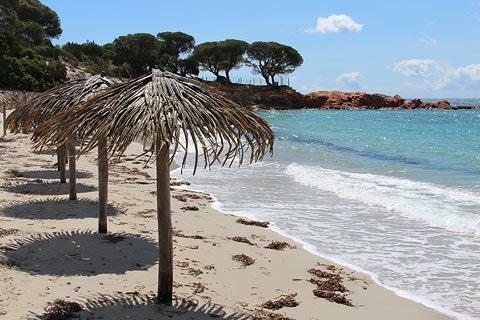 Palombaggia creates a great impression when you arrive because of the beachfront restaurant with its palm tree leaf parasols! 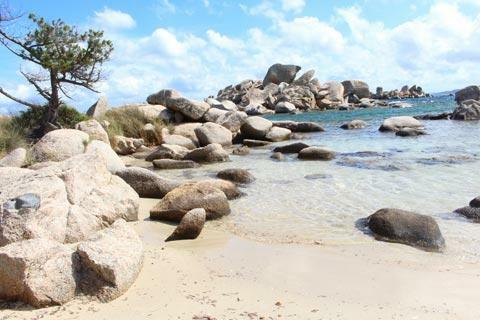 A short distance further is a small promontory of red rock with twisted ancient trees and then you reach the main beach, a long sweeping stretch of white sand around the bay that continues for about two kilometres. The further you get from the parking the less crowded the beach becomes. 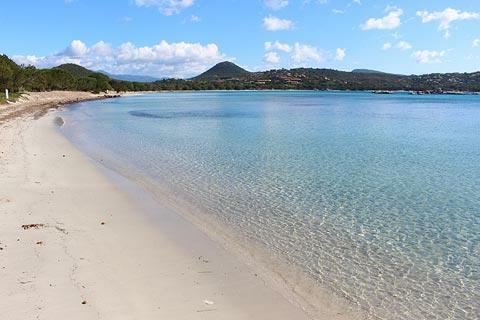 The Tamarriciu beach (also known as Falacca beach in some guides) is almost a continuation of Palombaggia beach and is immediately south of that beach. 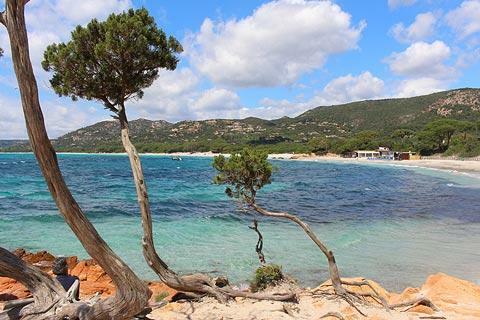 Therefore you can reach it by walking south along Palombaggia then crossing the headland by the small footpath, which only takes a few minutes - but remember that Palombaggia is a long beach so from the parking at the northern end of that beach it will take perhaps 30 minutes to reach Tamaricciu. An alternative is to get here by the path from the coast road. 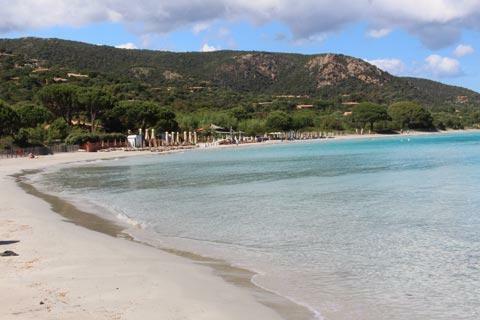 Driving along the coast road, a few kilometres south of Palombaggia (or about 4.5 kilometres from Bocca di l'Ora if you are approaching from the south or missed the path the first time) there are about 75 parking places along the edge of the road and a turn-off towards a small cafe. 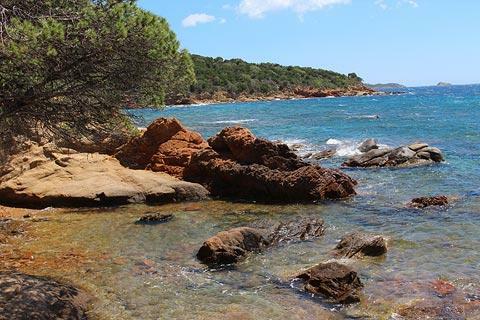 The path from here takes a few minutes to reach Tamarriciu beach and descends through the maquis with occasional stunning views across the beach and coast below. 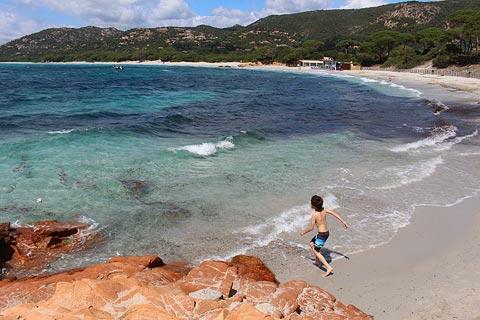 The beach itself is shorter than Palombaggia but equally beautiful and also with views across to the Iles Cerbicales about 200 metres offshore. There is a bar at the southern edge of the beach which is literally on the beach and is a lovely place to stop for a drink. Tamaricciu is also shallow and slopes gently so is suitable for children. 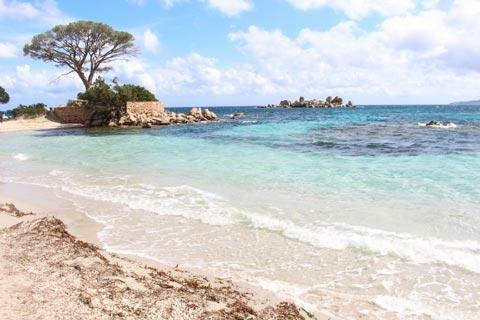 France This Way comment: if we had limited time to visit and had to choose from these three beaches, it is Tamaricciu that would get our vote. But we would be very sad not to be revisiting the other two! 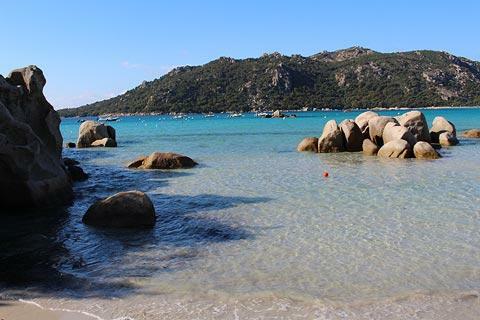 A few kilometres south of the two beaches above, Santa-Giulia beach is in a large natural bay and also long and sandy with promontories at each end to provide shelter from the wind. 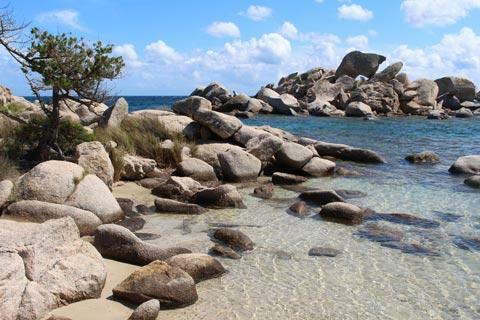 The beach slopes very gently into the sea and the rocks, reef and jetty will entertain your children. Various more energetic sporting activities are also available. As well as having various sporting activities and cafes it is also closest to the available accommodation with many small villas and residences available for rent on the hill behind the beach, although these are largely invisible when you are actually on the beach! 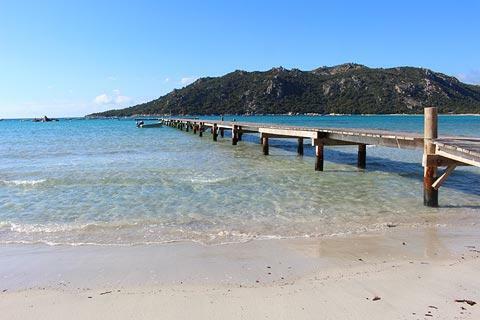 A small amount of free parking is available but it is more of a challenge to find here than at Palombaggia beach. You will often see dry seaweed on the beaches, more at some of times of the year than others. This is not a pollutant, it is a natural seaweed that is vital to the ecology of the sea here and also plays an important role in the ecology of the beach as well as reducing erosion. Villas and apartments are available within walking distance of these three beaches, especially the many holiday residences hidden on the hillside behind Santa-Giulia beach, but as you might guess, if you want to rent a villa close to three of the most beautiful beaches in Europe it is not going to come cheap. You will also need to reserve your accommodation well in advance if you are visiting in the summer: the prices clearly don't stop people from wanting to stay here! The beach at Rondarina is a few kilometres south of here and also very picturesque. 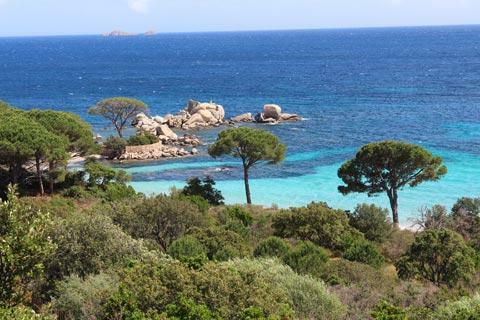 More beautiful coast and beaches can be seen if you take a boat trip out to the Iles-Lavezzi. 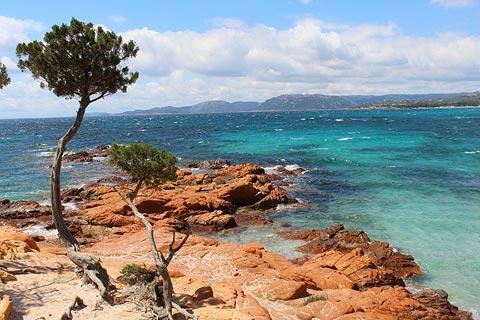 As well as these exceptional beaches, you will most certainly want to find time to visit the towns of Bonifacio and Porto-Vecchio.